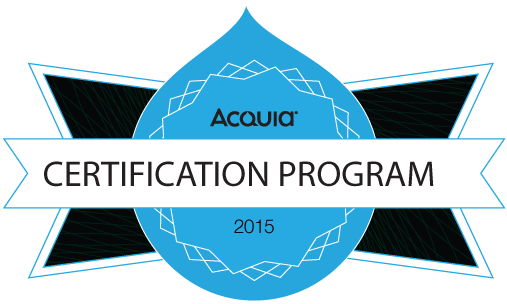 I have just completed my Acquia Certificatied Developer Exam. Initial words, it was harder than I expected. I did well on the exam but I wasn’t 100% sure on some of the questions, which left open some gaps and uncertainty when I pressed that “Submit Exam” button. It’s not easy to study for this exam, and they tell you this. The best way to prepare is just to have experience. I would agree with that statement. One other missing piece, is there isn’t a lot of sample questions out there so it can be hard to know what to expect when you’re in the exam. To prepare for the exam, I followed the blueprint Acquia offers on their site, and followed the links to the documentation in the areas where I felt my knowledge was lacking. During the exam a few of the things I read did help me select the right answer. Reading through the documentation could be that edge you need to walk away with a passing grade. That was basically the only preparation I did, other than working with Drupal for the past 6 years. After you register for the exam and give up your $250 fee, you need to do a few things to get your computer set up. Download and install the Sentinel app. This was a problem for me, because I run straight linux so I had to use a co-workers computer for the exam. I ended up using a mac desktop. It has a built in webcam and microphone so there was no problem there. It felt a little awkward using someone else’s computer. At least 24 hours before the exam you have to register your biometrics, which includes taking a bunch of photos of your face from the webcam, and repeatedly typing your name over and over. No problems there. One small problem occurred during the exam when suddenly the Sentinel app switched off and some safari popped up. I thought I was going to be penalized, and because I’m not a OSX power user it took me a few seconds to bring Sentinel back into focus and continue. However nothing was mentioned and I continued on as if nothing had happened. Once you launch the exam, you are in and the counter starts ticking down, 90 minutes. You have 60 questions to answer in 90 minutes which leaves 1 minute and 30 seconds per question. It sounds stressful on paper but it is an appropriate amount of time. I worked my way through the 60 questions and had 40 minutes spare to review. I ended up finishing completely with about 12 minutes remaining. Each question is either multiple choice or in some instances selecting 2 or 3 answers. As I said before, the exam is tough, however there are a few free answers in there to help you get through it. I consider myself a “back-end developer.” I spend most of my time working on modules, and I feel I am quite proficient at this. However, a lot of the stuff I do with modules is not covered in this exam, it is a lot more general. I found this to be a problem because this general back-end stuff is usually be handled by modules that have already been created and vetted by the community, the modules I build are often one off particular to a specific situation. The front-end stuff was probably the easiest section, and where I found most of the “free” answers. Acquia says, your first answer is usually the correct one. I can’t say if that is the case for sure as they don’t give you a breakdown of questions and answers after the exam. I don’t know specifically which questions I got right, and which ones I got wrong. Now here is the section that seems to be lacking around the Internet. I had about six questions that revolved around hook_boot() and hook_init(), mostly on the subject of caching. So make sure you understand what these two do during Drupal Bootstrapping and their differences. In conjunction with the above, learn all about Drupal caching. From core caching, to block caching, view caching, and how custom modules interact with caching. There were about 10-12 questions that had to do with caching on my exam. I only had one question on git, but it would be a good idea to make sure you understand some basic git commands to get a free answer. Views – Of course there would be a few questions about views but there was nothing to difficult. Just questions about relationships, contextual filters and of course caching. Hopefully these tips will help you narrow down your focus and give you a place to start studying for the Acquia Certified Developer Exam. Best of luck!